Years ago the Mediteranean diet was all the rage. Everyone was tapping into their secrets for living healthy lives. Since then, Greek food has been in the spotlight for it’s use of fresh herbs and spices, protein packed Greek yogurt, and flavorful meats. I am full-on obsessed with it. Bring on the Greek food! I am pretty sure I could eat Pita Jungle every day of my life and be happy. 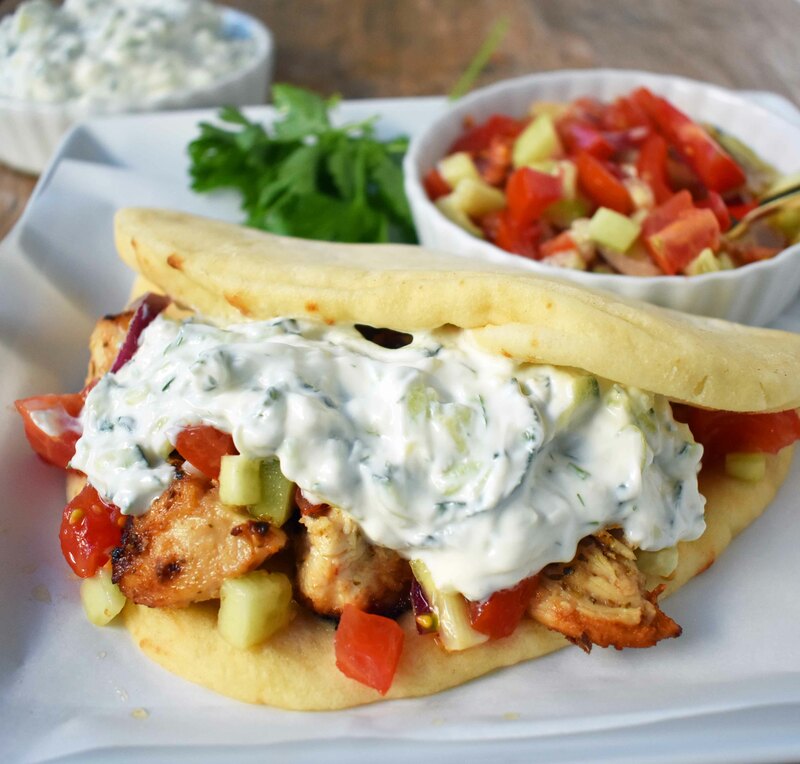 So, I wanted to create a homemade Greek Chicken Gyro recipe using marinated spiced chicken, grilled to perfection and topped with a homemade tzatziki sauce, fresh Greek Salad, all on a warm pita bread. Phenomenal! Marinate your chicken. You want it to not only be flavorful but juicy as well. By marinating it in greek yogurt, olive oil, lemon juice, spices, and red wine vinegar, it gives it time for the chicken to soak in all of those traditional Greek flavors. At least 2-4 hours is a suggested amount of time but 24 hours is ideal. Make your own Tzatziki sauce. It is so easy since it is made in one bowl and uses only the freshest of ingredients. The key is to squeeze out as much water from the grated cucumber as possible. This ensures that the tzatziki sauce stays nice and creamy. I used Fage 2% Greek yogurt but the fat-free version works well too. Taste for seasoning and salt accordingly. 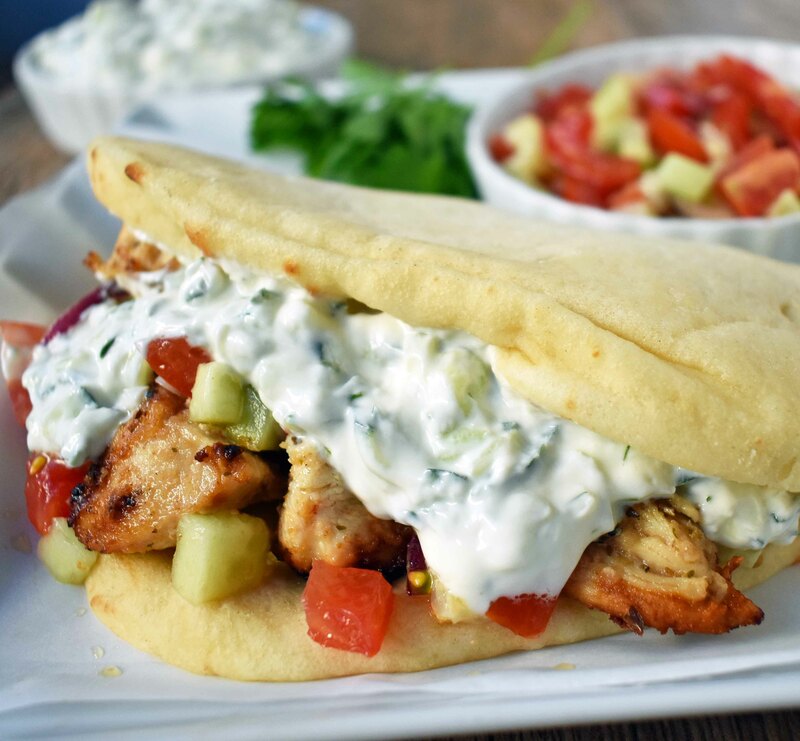 These Greek Chicken Gyros with Tzatziki sauce can be wrapped in your favorite pita bread. You can use soft flatbread or Naan bread as well. Warm your pitas before wrapping to make them nice and soft. You can also serve this chicken, Greek salad, and handcrafted tzatziki sauce in a bowl. Serve alone or on top of romaine lettuce. 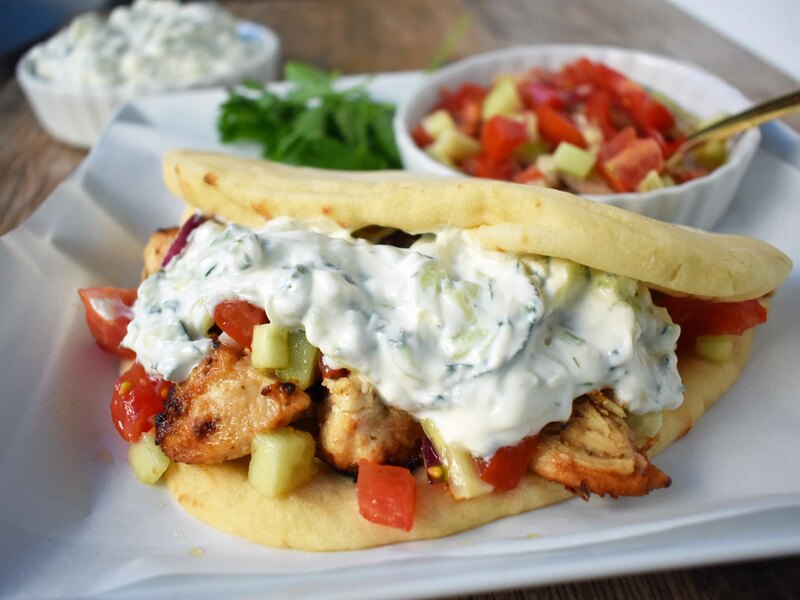 Marinated Greek Chicken topped with homemade Tzatziki sauce and Greek salad in warm pita bread. Place chicken, yogurt, lemon juice, olive oil, vinegar, salt, pepper, and oregano in bag and let marinate at least 30 minutes, preferably 2-4 hours. The ideal time is 24 hours. To make tzatziki sauce, stir together yogurt, olive oil, lemon juice, vinegar, salt, dill, and garlic. Stir in grated cucumber and taste for seasonings. Squeeze the cucumber to remove excess water before adding to rest of ingredients. To make greek salad, place tomatoes, cucumber, red onion, parsley, olive oil, salt and pepper in bowl. Stir to coat. Season to taste. Chicken can be cooked on grill or in skillet. To cook on grill -- place chicken on kebobs and heat grill to medium heat. Cook for 5-7 minutes per side or until chicken is full cooked. To cook chicken on skillet. Heat skillet to medium high heat. Sprinkle with oil. Add chicken and cook for 8-10 minutes, or until chicken is fully cooked and golden brown. Place chicken in pita bread. You can warm the pita bread to make it pliable. Top with tzatziki sauce and greek salad. Add additional feta, if desired. 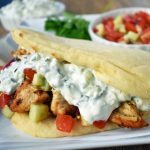 I hope your family loves these Greek Chicken Gyros with Tzatziki Sauce and I can’t wait to hear all about what you are making in your kitchen! I made thus tonight for my family. It was AMAZING!!!! Thank you so much;!! Made these for dinner last night and they were delicious! Definitely keeping this recipe around. Thank you. I made these for the first time 2 weeks ago and again tonight, the chicken, tzatziki sauce and Greek salad are fantastic and huge hit in our house! Reminds us of our favorite Mediterranean food truck so this is now a standard in our home! Thank you!! I was wondering if these could be made ahead and frozen. Hi Connie! I haven’t tried freezing them. I am not sure how the tzatziki sauce would do frozen. The chicken should be just fine though. If you try it, let me know how it turns out! This looks delicious! What brand of pita bread do you use? This is my new favorite recipe! That tzatziki is AMAZING. I made these last night and it was so good. I didn’t change a thing in the recipe. Yum. Just so much yum. Awesome recipe! My meat and potato husband even liked them. Thank you for the great recipe. Thank you so much, Susan! It’s one of our favorites too because it is so full of FLAVOR. So happy your husband liked it too! I made these today for lunch. Absolutely delicious! I was able to marinade the chicken overnight too. My chicken didn’t look as good as your it still tasted great. Love the sauce and used it multiple times on a wrap with extra chicken I had. It was a great hit with me and my husband. Beautiful my daughter ask for it a 2nd time in same week. Nothing left. Easy recipe. I’ve been craving this meal for a long time. Made it tonight and it was fantastic. The real deal! Tons of flavor!! This is going into our family recipe book! I made this recipe the other night and it was delicious! Even my husband who is not a fan of chicken loved it. This is a keeper. Thank you for sharing! How do I squeeze the juice out of the cucumber?